Dark mahogany finish and pale sage faux suede interior makes this jewelry box the perfect addition to any decor. This jewelry box offers an abundance of storage and attractive styling. Swing out doors feature eight necklace hooks with compartments below to keep necklaces tangle free. Five pull out drawers with two ring bars and seventeen jewelry compartments to store all styles of jewelry. Drawer pulls finished in bright nickel finish. 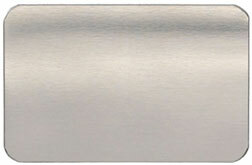 Optional brushed silver personalized engraving plate attaches to the top center of jewelry box cover. Jewelry Box Dimensions: 13 1/2" x 9 1/2" x 12". Click the button below to add the Patricia Jewelry Box to your wish list.